Attention Wal-Mart shoppers! Today's special is the exclusive Disney release of "The 3 Wise Men." In keeping with Wal-Mart's attempt to keep Christ out of Christmas, we are selling this deceptive Spanish film, dubbed with English actors in order to make some money off of the holiday. After all, money is the reason for the season. Please forgive us for the deceptive DVD cover that leads you to believe that this movie is an animated tale about the real reason for the season. Be sure to keep your receipts, so that when you finish with the film and discover that only about 45 seconds of the film even deal with the birth of Christ, you can be sure to get your money back. Thank you for your attention and from all of us at Wal-Mart, have a happy holiday of your choosing. 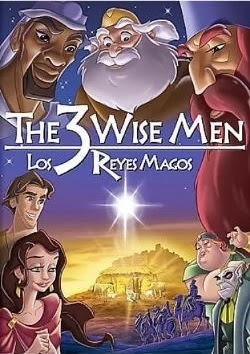 Disney's new DVD "The 3 Wise Men" is a newly dubbed release of a 2003 Spanish film. American actors Martin Sheen and Emilio Estevez have been brought in to Americanize the film. In a strange, but understandable turn, Disney is only making the movie available through Wal-Mart stores. The store is currently in hot water with Christians who are upset that the store is refusing to recognize the holiday by not allowing its employees to say Merry Christmas. For those people of faith who do go into the store, they might be tempted to pick up this film. They shouldn't. The movie is book-ended by a modern tale of a small boy who doesn't believe in Christmas anymore because he didn't get what he wanted for Christmas the previous year. In a fit of rage, the boy steals the gold star from the town's Christmas tree. In his flight from arrest, the boy ends up in a corner soda shop. The old man in the store decides to tell the boy about the real reason for the season. Incredibly, the old man's tale involves the three Magi from the Bible, but they are now good magicians ALA Professor Dumbledore. They make their journey to follow the star, only to do battle with the demonic advisor to King Herod, Beliel. They battle a dinosaur size demon, and rely on occult magic to make the journey. The tale is a bizarre mix of fantasy and comedy, that is totally out of place in a DVD that is presented as a traditional, up-lifting tale of the real reason for Christmas. The target audience will be sorely disappointed. The non-target audience will not care to buy this as it is advertised as an animated religious picture. Switches and ashes to the folks behind this travesty. Terrible and misleading movie. Great picture. OK sound. No extras at all. The movie was made for a theatrical release in Spain. The animation is quite good. Rich, well-saturated colors. No artifacts or pixilation. No loss of dialogue. At times, such as the aforementioned demon dinosaur battle, your home sound system will get a work out. There are no extras at all. Avoid this DVD at all costs. The 2 out of 10 rating is for the fine picture alone. If the movie weren't so good-looking I would have given it a 0 out of 10.